Brooke Parker never expected to find herself in the tiny town of Juniper Falls, Minnesota. Of course, she also never expected to lose her dad. Or for her mom to lose herself. Brooke feels like she’s losing it…until she finds Juniper Falls hockey. Juniper Falls girls’ hockey, that is. Jake Hammond, current prince of Juniper Falls, captain of the hockey team, and player with the best chance of scoring it big, is on top of the world. Until one hazing ritual gone wrong lands him injured, sitting on the sidelines, and―shocking even to him―finding himself enjoying his “punishment” as assistant coach for the girls’ team. As Jake and Brooke grow closer, he finds the quiet new girl is hiding a persona full of life, ideas, and experiences bigger and broader than anything he’s ever known. But to Jake, hockey’s never just been a game. It’s his whole life. And leveraging the game for a shot at their future might be more than he can give. 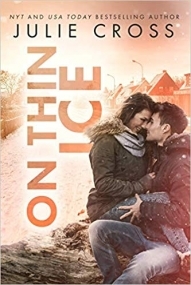 ON THIN ICE is a sweet YA contemporary romance that follows Brooke and Jake in alternating chapters/points-of-view. Brooke is new to Juniper Falls, this odd town where hockey is king and the high school Otters are the penultimate. She moved there with her mother, who was originally from there, after her father was falsely put in prison for a changed narrative and her mother began to have mental health issues (which are not well defined). They live with her grandmother in an old farm house. Brooke is determined to do everything differently, beginning with listening rather than talking. She was a dedicated ballerina, but there's no dance in Juniper Falls. When she sees a hockey practice, and the dance-like quality of the moves, she decides to sign up for the newly forming girls' hockey team where no experience is required. Jake is lined up to be the Captain of the varsity team in his senior year and be drowning in recruiters and offers. In the pre-season, there's an Otter tradition where the seniors haze the freshman. Hating every second of it, but feeling like he has to participate in this over 100-year-old tradition, Jake is shocked when it all goes wrong, he ends up badly injured, and a freshman ends up airlifted to a hospital near death. Protecting their own is second nature, and Jake takes the fall for what happened. His punishment is community service- more specifically to help coach the new girls' hockey team. As Brooke and Jake get closer and deal with larger issues, a deeper romance begins to build, leading to something big neither of them would have expected. The romance in this book is top notch. Jake and Brooke are there for each other in all the ways that count, and their love heats up the pages. The bigger stories here are about the other things going on in their lives, primarily Jake's (although Brooke has some HUGE issues that are mentioned but not fully dealt with). The major issue is related to the way the town treats hockey and the team, considering the unequal treatment of athletes, allowances that can be harmful to not only others but also the students themselves, hazing, and the power and dangers of the lies around all of it. These issues are handled really well, and we end up hearing a lot of stories that all feed into the same issues with the way the town treats the sports and team, including the past police, school/classes, and family issues. Jake is a great poster boy for all of this because he has the most to lose, but he also feels a lot of guilt when not doing the right thing. We see the conflict and the later resolutions. I think this story line was very strong. I wish we could have had more insights into the mental illness plots of the book,, particularly with Brooke and her mother. We see it happening, but we do not get the full story nor the full resolution (some resolution at the end but not really information about the journey to get there). I felt like this could have been an equally big piece of the book, and I would have liked to have gotten more insight throughout the book and see an equally large discussion. I also do not agree with the portrayal of medications used to treat mental illness as inducing a "zombie-like" state- this is a really common misconception and can lead to people resisting treatments they potentially need. I feel like it could have all been handled better. Brooke is also mostly left to herself to handle all these big and horrible events, and I would have liked to see her getting some help/seeing a therapist to talk through it. This may have been happening (e.g. we hear a mention about a family evaluation/not sure if it could have continued), but it would be nice to have it explicitly stated. Her really big issues felt mostly brushed aside in favor of Jake's issues in terms of the plot, and I would have liked to see more discussion of them. Overall, I really enjoyed this YA contemporary romance- it really delves into some big and important issues (on Jake's side) plus has a completely swoon-worthy romance. It was very much a page-turner, and I am really enjoying this series (where each book can be read as a stand-alone)!